Russian foreign ministry spokeswoman says anti-Russian forces in the West are trying to destroy progress made on Syria peace with Russian mediation. 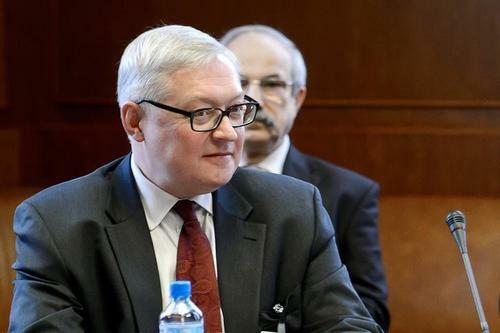 ReutersThe U.S. position on Syria remains a mystery to Moscow and Washington's rhetoric tends to be primitive and loutish, Russian news agencies quoted Deputy Foreign Minister Sergei Ryabkov as saying on Wednesday. President Donald Trump's administration accused Russia of trying to shield Syria's government from blame for a deadly gas attack, as Secretary of State Rex Tillerson brought a Western message to Moscow condemning its support for President Bashar al-Assad. Tests on victims of a suspected chemical attack in Syria's northwestern Idlib province confirmed the use of sarin gas, Turkey's health minister Recep Akdag was quoted as saying on Tuesday by the state-run Anadolu news agency. Both Washington and Ankara blame the Syrian government for the poison gas attack which killed nearly 100 people including children, but Damascus has denied responsibility. The United States launched missile strikes last week against a Syrian government air base in response. Italy's President Sergio Mattarella urged Russia on Tuesday to use its influence with Syria to thwart any more chemical weapons attacks there. "We call on everyone, Moscow like everyone, to use their influence to avoid that such attacks are repeated," Mattarella said at a news conference with Russian President Vladimir Putin. "We have information that a similar provocation is being prepared ... in other parts of Syria including in the southern Damascus suburbs where they are planning to again plant some substance and accuse the Syrian authorities of using (chemical weapons)." Syrian Foreign Minister Walid al-Muallem will travel to Moscow soon on an official visit, the RIA news agency cited the Syrian ambassador to Moscow as saying on Tuesday. Talks will focus on U.S. allegations of a poison gas attack in Syria's Idlib province and the subsequent U.S. missile strike on a Syrian air base, the ambassador was cited as saying. The Russian Defence Ministry said on Tuesday that two of its soldiers had been killed in a mortar attack in Syria and a third was fighting for his life, the RIA news agency reported. The ministry said that the Russian military instructors were embedded with a Syrian army unit and -- along with a Russian military adviser -- had come under mortar fire from a group of militants. U.S. Secretary of State Tillerson says it's clear the "reign of Assad family is coming to an end"
The Group of Seven nations will tell Russia to stop its "hypocrisy" in Syria and work with other countries to bring an end to the civil war, French Foreign Minister Jean-Marc Ayrault said on Tuesday. "The G7 will tell Russia very clearly that this hypocrisy has to stop. It needs to genuinely and sincerely engage with the political process to get ourselves out of this situation we found ourselves in," he told reporters at the G7 meeting in Tuscany. He said the U.S. missile strike on a Syrian air base last week had opened a "small window of opportunity" to try to end the conflict. The question of added sanctions had barely been mentioned in the meetings, he said. Britain's Foreign Secretary Boris Johnson said on Monday that London would discuss the possibility of further sanctions against senior Syrian and Russian military figures.